There’s a guy named Adam Mathes who makes things, and one of the things he made is called mail me daily which is drop-dead simple…. you enter a web site URL and your email, and you magically get email updates from the site. Obviously the site has to have an RSS feed, and you have to have an email address, but besides that, it’s pretty simple. For people who still use email, or get confused by RSS readers, or some other third thing, this is nice… For people who love email. You can subscribe to RasterWeb! and get excerpts of these posts in your email, which will remind you to stop by the site for a full read. Now, make no mistake, I’m not trying to sell you anything, this isn’t some hard sell to subscribe to my newsletter! but if you’re interested in what I post here, this may be useful. 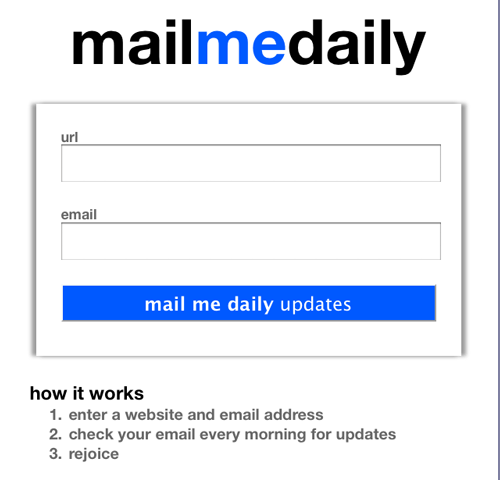 mail me daily has no ads, and cost no money (right now anyway) so I’m interested to see if anyone finds it useful. Posted on Tuesday, October 5th, 2010 at 9:50 am. Subscribe to the comments feed. Both comments and pings are currently closed. Post on your own blog. This is a ^&*%# neat idea. Should implement this on my site. “mail me weekly a list of new pages”. Hope that Drupal can do this.